28 January 2014. Addis Abeba. NEPAD, November 2013, 72 p.
The NEPAD-AUC publication was presented by the AUC Commissioner for Rural Economy and Agriculture Mrs Tumusiime Rhoda Peace and NEPAD Chief Executive Officer Dr Ibrahim Mayaki. The Publication is a state of the art, defining the key priorities and opportunities to advance agriculture. 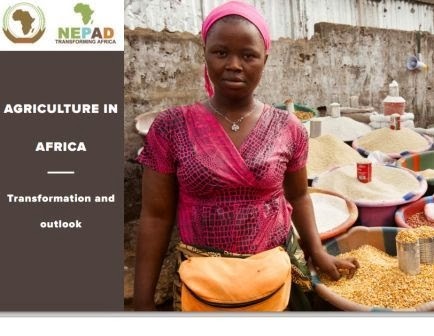 It is developed within the context of sustaining the CAADP momentum and especially to inform decisions on key issues that will drive agriculture into to the next decade and beyond. It reflects debate and consultations going on with regard to two key themes, Agenda 2063 and Post 2015 Agenda. 23-24 January 2014. Pre-African Union Summit meeting: Theme Empowering Women for Agriculture and Food Security. Gender is My Agenda Campaign (GIMAC) held its bi-annual pre-summit consultative meeting at UNECA in Addis Ababa, Ethiopia with the theme “Mainstreaming Gender in the African Union; Women in Agriculture and Food Security”. The main objective was to mobilise a diverse cross-section of women to dialogue on women’s issues in agriculture, reproductive health and rights and violence against women, and make recommendations to the 22nd AU Summit. They also wanted to deliberate on how these issues affect their livelihoods and in turn affect their agricultural production and food security. At the 23rd consultative meeting on gender mainstreaming in the African Union, Mr. Carlos Lopes, Executive Secretary of the UN Economic Commission for Africa (UNECA) said that food security is within reach and that “Africa can and should feed Africa”.